I am using the education version of Autocad 2011, and I usually print my drawings at school. However I need to print drawings at home but when I print I am missing the border at the right side of the page only. It is required by the instructor that the border be at all four sides of the drawing. Also, we must use viewport 1 and select the entire dotted line as the outside border. How can I ensure that my entire border is visible after printing. I am including a picture that shows the missing right side of the border. First of all, y dont u just get rid of the Autodesk marks. Its very simple to get rid of them. To avoid these marks while plotting, first saveas the drawing in *.dxf format. 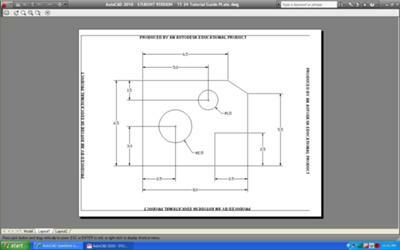 (AutoCAd 2000/LT2000.dxf. After saving, close the file. DO NOT save when asked for "Save in AutoCAD drawing format?" Just open the same DXF file which you have saved at the source location. Now this time save as AutoCAD format. Now, when u plot there wont be any Autodesk marks on any sides. If the line on the right side is not visible, then plot the drawing in fit to paper. Your all the lines will be visible without the autodesk mark on it. Hope I have answer the Question.